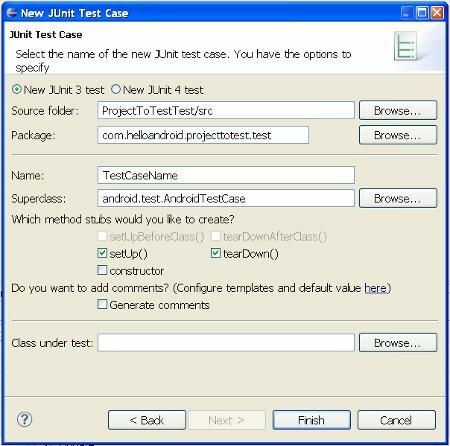 For unit testing you can use the built in JUnit framework just like in "standard" java applications. A unit test is to test some low-level part - usually a single class - of a project, working individually. 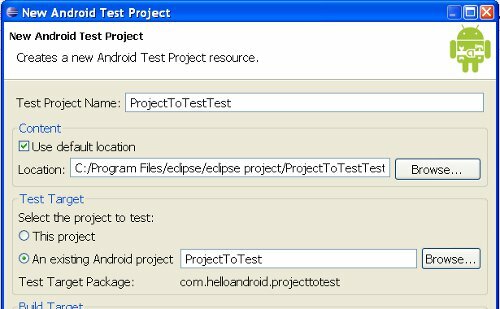 The only trick is to extend AndroidTestCase in your test case instead of TestCase some Android specific methods, like getContext() which is often required by android functions. Add the previously created project as the test target, the other fields can be left as they are auto filled. 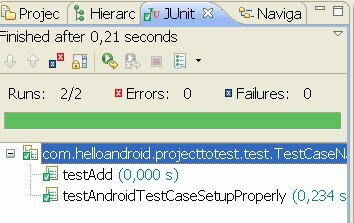 Be sure tho change superclass to junit.framework.TestCase. For some reason eclipse does not fill out constuctor properly, so just uncheck it for now. The setUp() method runs once before all test methods, the tearDown() runs after all tests are runned.